Jul 01 2018	Be the first to comment! William Lafayette Gray passed away on June 28, 2018. He is survived by his wife, Shirley Corbin Gray, sons & daughters in law: Bernard Keith & Devona Kay Gray and Byron Heath Gray & Natasha Robinson; granddaughter: Paige Alexandria Gray; brother & sister in law: Robert & Regina Gray; sister: Carolyn Gray and a host of nieces and nephews. Louisa Meyer kindly shared that William died unexpectedly Wednesday morning. William was undergoing treatment for prostate cancer, had a successful procedure, but had an adverse reaction to a medication. After ARCO, William taught in Dallas ISD where he and Louisa reconnected. “We stayed in touch via Facebook and had a long lunch together last year. We laughed a lot and, as you know, he was always full of wisdom. 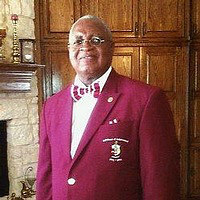 I especially liked learning about his fraternity’s mentoring program,” emailed Louisa. You may write his family at: 1908 Windmill Hill Ln DeSoto, Texas 75115. The family will receive friends at the Friendship West Baptist Church, 2020 W. Wheatland Rd., Dallas, TX 75232 on Tuesday - July 3, 2018 from 10:00 A.M. until 11:00 A.M. with the Funeral Service beginning at 11:00 A.M. with Reverand Claude Bradshaw, officiating. Interment will follow in Holy Redeemer Cemetery, DeSoto, Texas.